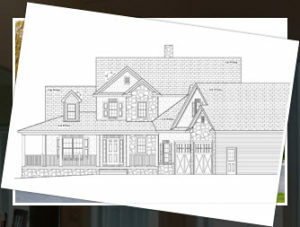 Over the last few months, we’ve provided an overview of the process of building your custom home. You can find past articles in this series here. It is important to remember that many different components were used to construct your home, and these materials take time to acclimatize to being part to of a new structure. During that first year of living in your home, you may notice some screw pops in the drywall or caulk joints that crack and separate where wood trim meets drywall. This is all part of the settle process. Additionally, we are in a unique part of the country for weather extremes. Typically, there are a few days where we experience near 100 degrees in the summer and in the winter, it is quite common to see days where the temperature dips near 0. Most building materials are designed to expand and contract with the heat and cold. As lumber dries out and expands and contracts, it shifts ever so slightly which can create screw pops and caulking to crack. While you understand that all of this is quite common, it can still be frustrating to see little imperfections in your newly build home. Don’t worry. We’ll come back and fix all of these cosmetic issues; however, because we know that your home has to “live through” all four seasons, we’ll come back to your home in about a year’s time. We recommend that you keep track of any issues you see so when we schedule your follow-up appointment, we have a clear pictures of what needs addressed. Finally, we provide a comprehensive one-year warranty with all our new homes, but we will continue to provide any service you need beyond the life of the warranty. Thinking about building a home? Contact us to set up a time to talk. No fee. No obligation. Just us sitting down together to hear about your plans and ideas. Posted in New Construction, Process on April 1, 2015 by metzler.